Both the attack symptoms and the damage caused by the rice worm are different depending on the development stage of the rice plant. In any case, they are caused by the larvae, which bore the canes to feed themselves with the corresponding inner tissues. Frequently, the attacked plants are arranged in circles or little groups. This is due to the fact that usually, the larvae do not move very far from the plant where they have done the laying. They only move to another cane when they need more food or when they want to find a suitable cane for chrysalis. Rice in a vegetative state is attacked by larvae from 1st generation towards mid June and the clearest symptom is the appearance of canes with a dry central leaf (photo 1). Even though there is little damage, since the plant usually has the capability to make sprouts and make up for the affected canes, this population level will have influence on future attacks. During the blooming period and the beginning of the earing period, there is usually an attack of larvae from the second generation, with the consequent typical appearance of white spikes (panicles) although this symptom is not exclusive from the rice borer attack (photo 2). It is the most severe attack, since the affected plants may end up having very low productions. During the earing period, the rice in grain, doughy and hard is attacked by larvae from 2nd and 3rd generation. 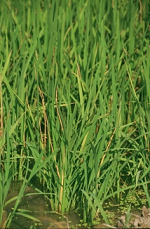 The signs of the rice borer attack at this stage are plants with more vertical spikes than the rest due to the relatively little weight of the rice grains. This attack may also affect the cane itself because sometimes it is not solid enough to hold the plant’s weight and it lies down. In this case, if the spikes stay inside the water for a long time, the grains will be spoilt (germination in the panicle itself) and reaping will be made difficult since the machines take longer to collect this rice.